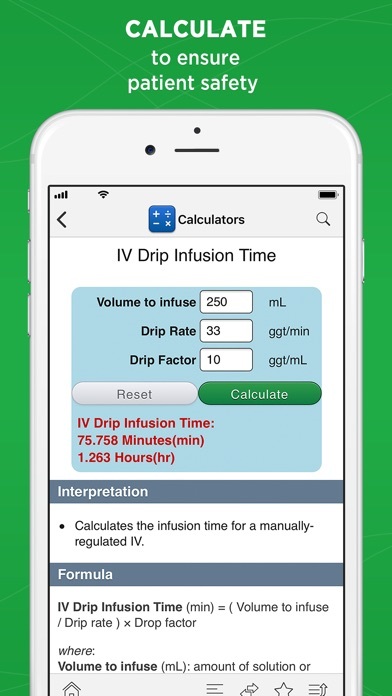 ** Features Prime PubMed with exclusive journal searching tools ** == PLEASE NOTE: This application requires an institutional subscription. == ** CURRENT uCentral subscribers can download content to their iOS device at no cost. 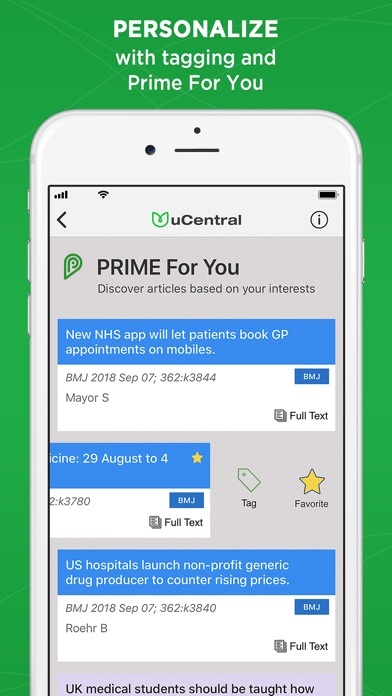 ** ** To find out if your institution subscribes to uCentral, please contact your librarian or system administrator ** _________________________________________ uCentral™ uCentral is the only all-in-one app that delivers the information a clinician or trainee needs at the point of care. 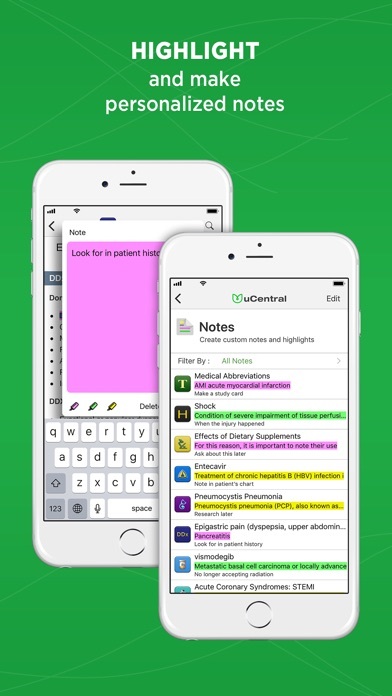 uCentral gives libraries and institutions the power to deliver trusted medical reference content, valuable tools, and full-text journal articles directly to their patron’s mobile devices. With uCentral, each institution creates a customized aggregation of quick-reference content and makes it available to all of their patrons. 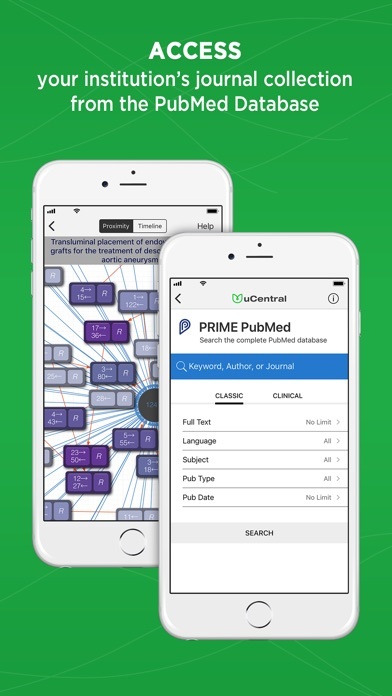 uCentral includes Prime PubMed, delivering over 25 million articles to your iPhone® and iPad®. With links directly to local holdings, uCentral leverages your library’s journal collection by providing patrons direct access to full-text articles. 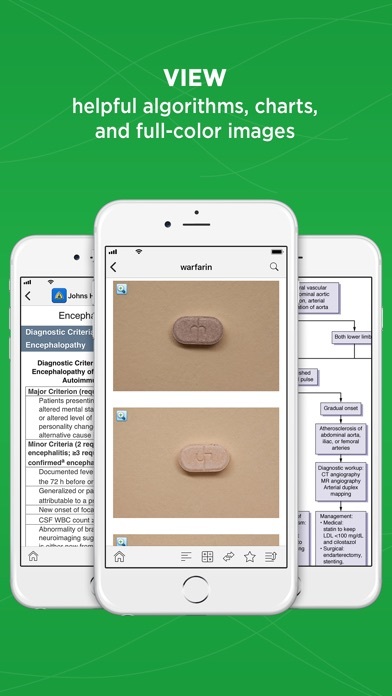 Lastly, explore the literature like never before with Grapherence® - a revolutionary approach to finding relevant articles visually More than 30 references are available through uCentral, including: • The Washington Manual • 5-Minute Clinical Consult • Bates' Pocket Guide to Physical Examination and History Taking • Exclusive! 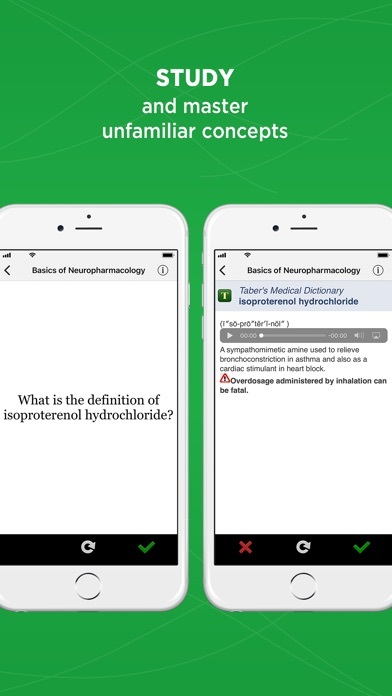 Johns Hopkins Guides (ABX, Diabetes, HIV, Psych) • Harrison’s Manual of Medicine • Cochrane Abstracts • Davis’s Drug Guide • Taber’s Medical Dictionary FEATURES: • Universal Index and Full Text Searching – quickly find topics across all references • Cross Links for fast navigation between resources • Personalized favorites with tagging • Frequent updates and new editions when they’re published • Create custom notes and highlights within entries • Tips, Notifications, and Institutional Messages (iPad) • Recently Viewed feature • Web access _________________________________________ Instructions for current subscribers: • Install this application to your iOS device • Open the application and enter your uCentral username and password, then tap “Login.” • The latest uCentral content will download to your device. Content available through uCentral includes: 5-Minute Clinical Consult, Johns Hopkins Guides, Washington Manual of Medical Therapeutics, Bates' Pocket Guide to Physical Examination and History Taking, Taber’s Medical Dictionary, Davis’s Drug Guide, McGraw-Hill’s Diagnosaurus, Davis’s Laboratory and Diagnostic Tests, Diseases and Disorders, Clinical Evidence, Pocket Guide to Diagnostic Tests, 5-Minute Emergency Medicine Consult, 5-Minute Pediatric Consult, Harrison’s Manual of Medicine, Yamada Gastroenterology, and more.